We can’t put it off any longer. It’s time to become accountable for our actions, and announce our New Year’s Resolutions, both personal and professional, for 2012. If you’re still searching for your goals this year, help yourself to any of these! Maybe you don’t have the greatest resolution track record… If you’re worried about the commitment, just think of these as “intentions” for 2012. Finally, if you have any great resolutions of your own, let us know! Cook More Often: This may seem like a no-brainer for an office full of chefs and foodies, but you’d be surprised how quickly a long day at the office can derail the best of intentions. Try working your way through a good cookbook, or mastering the art of 50 recipes. We love Food52’s New Year’s Resolutions, with specific, attainable goals that can be tackled at one’s own pace. Practice Gratitude: Each day, when you get up or before you go to bed, write down 5 things you are grateful for. If there are any people on the list, let them know you appreciate them. Bibby, Parties That Cook founder and CEO, recently submitted this resolution to SkinnyScoop’s big list of resolutions. Win at Least One Big Award: While this goal applies to Parties That Cook as a business, you can easily adapt this to your own career. Maybe you’re looking for the recognition you deserve, make this the year you get that promotion! Be More Green: Now that we’re a certified B-Corp., we’re making it a priority to reduce waste in the office. In your personal life, strive to make the green decision whenever possible. It could be something as simple as bringing your own bags to the grocery store, or taking the time to find a recycling bin before throwing recyclables away. Reduce Coffee Intake: We’re not saying any of us are dependent, or anything… But hey, maybe it’s time to cut back when skipping your morning cup turns you into one of Lady Gaga’s not-so-little monsters. Slow Down: The daily grind can get you pretty wrapped up. To unwind, try doing more yoga, meditating, or just reflecting on the day/week more often. Whichever route you choose, it’ll help you be more present in your daily life. Practice Fiscal Responsibility: This can be something as seemingly insignificant as bringing your lunch to work 3 times a week, holding yourself to only ONE drink at the bar, or implementing a savings plan for the bit-ticket item you’ve been eyeing (Le Creuset cookware set, anyone?). Mint.com has a great list of Resolutions for Frugal Foodies. Travel More: Sometimes you just need to get away. Whether it’s a big trip, or just a staycation in a nearby town, change your surroundings for a bit. A couple of PTC office ladies will be heading to Arizona for Spring Training this year! One is a proud San Francisco Giant’s fan, the other happens to be a D-backs fan… Obviously, they aren’t going together. Continue Learning: Do we really learn something new every day? Make it a goal. Always wanted to learn a new language? (Spanish? French? HTML?? Wookie?!?) Just do it. Maybe you’ll finally learn to cook, or hone your skills at Photoshop. A thirst for knowledge makes you one of the most valuable members on your work team, and helps your continual growth as an individual. HAVE FUN: This year, try saying YES more than NO. (We trust your judgment… Though if you’re anything like our Michelene, you might end up agreeing to run another half-ironman!) 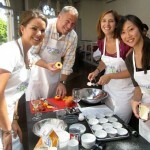 You could entertain monthly, throw your own cooking parties, or go on a spontaneous adventure! Okay. Okay. So you told all your friends you were going to get healthy/give up junk-food/give up meat/start cooking more/eat out less. No need to panic. We know there’s a lot on your plate, and we trust that none of it is a super-sized order of fries (you opted for small, right?!). That’s exactly why we’re bringing you this super simple recipe for Roasted Kabocha Squash and Arugala Salad with Toasted Hazelnuts! Yes, salad in the winter. Kabocha Squash (not kombucha) is a winter squash, sweeter than butternut squash and actually rivaling the flavors of pumpkin and sweet potatoes. The light vinaigrette and the maple syrup drizzle during the roasting process only sweeten the deal. Trust us, if you aren’t already acquainted with Kabocha, this salad will make it worth your while and help you check each of those resolutions off your list. Added BONUS: Check out these tips rules for conquering the gym this year! Slice Squash: Cut the squash in half and remove the seeds using a large metal spoon. Cut each half, skin on, into 1 inch thick slices. Place slices into a large bowl and toss well with the olive oil and salt. Roast Squash: Transfer the squash to a sheet pan(s), placing in a single layer, and roast until the squash is tender and starting to brown, about 20 minutes. During the last 10 minutes of roasting the squash, brush slices with the maple syrup. Roast until squash is done. Remove from oven, cover with foil and keep warm until service. Make Vinaigrette: Mix the sherry vinegar, lemon juice, mustard, shallot, sugar, salt and pepper in a mixing bowl and let sit for 5-10 minutes. Slowly pour in the hazelnut and olive oils while whisking vigorously to emulsify. Toast Hazelnuts: Spread hazelnuts on a sheet pan and toast in the oven until lightly browned. Serve: Reheat squash if necessary. Then, brush the squash with half of the vinaigrette. 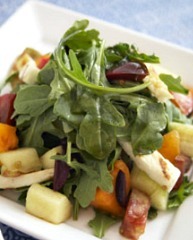 Just before serving, toss the arugula in a large bowl with the rest of the vinaigrette. Top each salad with some squash and hazelnuts . Using a rasp, generously grate the Ricotta Salata on top of each salad. Serve.